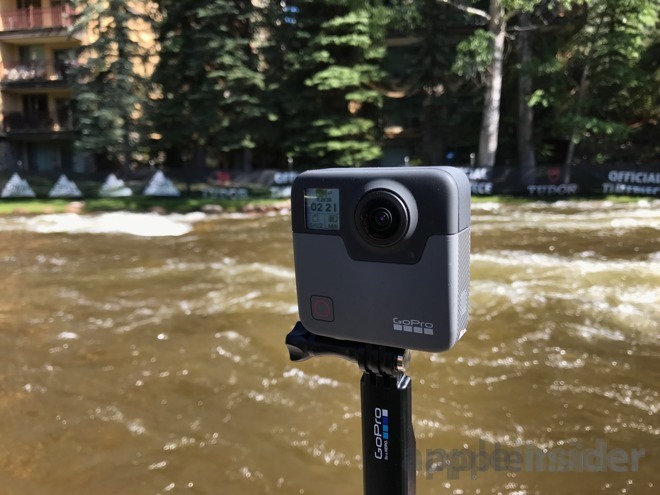 GoPro on Wednesday took the wraps off of its fall 2017 lineup headlined by the new Fusion camera, capturing footage in 360 degrees and using an iPhone's gyroscopes to edit the scene, as well as a new Hero 6 Black capable of capturing 4K video at 60 frames per second. AppleInsider was there for the event in San Francisco with exclusive images and details. 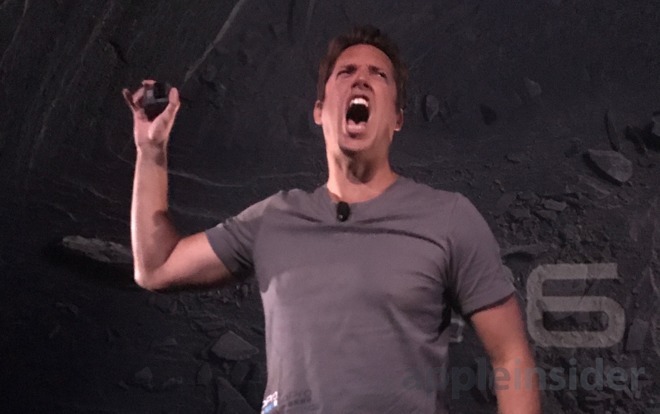 GoPro CEO Nick Woodman holding the Hero 6 Black. The new GoPro Hero 6 Black is available now, and is priced at $499. The tentpole feature is a new custom processor, dubbed the GP1, that offers better image quality and performance. Advanced new built-in stabilization makes footage seem like it's on a gimbal, while a new Wi-Fi chip is three times faster. There are also touch-zoom capabilities and more voice commands. 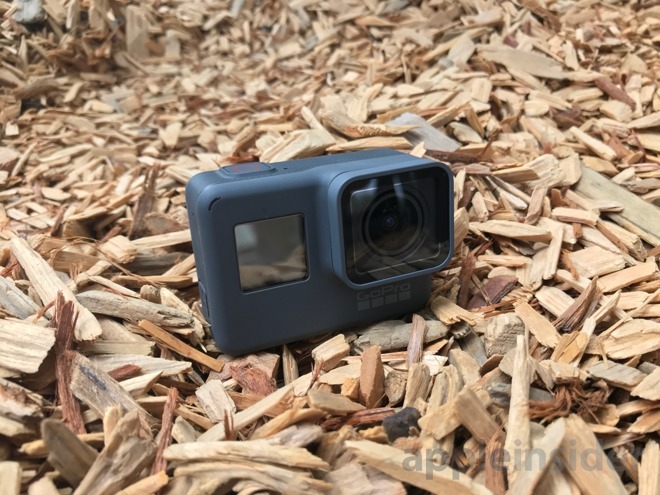 The GoPro Hero 6 Black can record 4K footage at 60 frames per second, 2K resolution at 120 frames per second, or 1080p HD video at 240 frames per second. The company also gave final details on its Fusion camera, which AppleInsider went hands-on with in June. The 360-degree camera will launch in November for $699, and preorders are being taken now. Fusion captures everything around it, ensuring nothing is missed during action shots. It has two lenses facing in opposite directions, and unique hardware and software automatically stitch the two images so that a seamless image is seen. By integrating with the GoPro app for iOS, Fusion makes it simple to view, edit, crop and showcase unique perspectives with the camera. Features are available as presets in the GoPro app, headlined by "Overcapture." Overcapture takes the 360-degree video and captures just as slice of it, presenting it as a normal video. Using the GoPro app and gyroscopes and sensors within the iPhone, the user can virtually direct their video as they see fit, presented as a more traditional (and not distorted) video. GoPro Chief Executive Nick Woodman also showcased "Angel View," which automatically removes a pole from the shot in front of a user. Another shown was called "Little Planet," morphing the spherical image to make the world below seem like a tiny globe. Finally, "Panoflow" does complex panning that used to require devices like a gimbal to accomplish. These effects will launch in a free GoPro app update in early 2018. 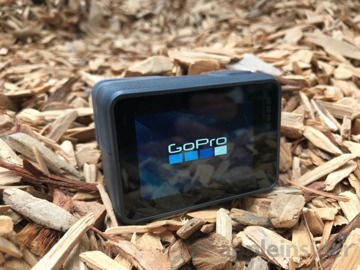 The iPhone plays an integral part in GoPro's products, including the company's free Quik Stories app, which automatically copies photos and videos over to a connected iPhone and then automatically edits them. Quik Stories uses advanced algorithms for recognizing faces, audio, accelerometer data, and GPS location data. Taking all of that knowledge, it intelligently edits footage to create a compelling story. Finally, GoPro's existing Karma drone hardware has received a software update adding new follow-me capabilities, and a look-up camera tilt function. The Karma drone is bundled with the Hero 6 Black for $1,199, or can be purchased separately from the camera for $799. It includes the Karma Grip gimbal. 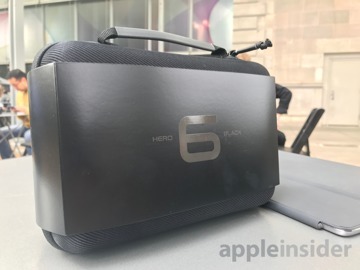 The GoPro Hero 6 Black is available now at B&H Photo for $499.99 with free expedited shipping to contiguous U.S. addresses and no tax collected on orders shipped outside NY and NJ. Best Buy also has the Hero 6 Black in stock for $499.99 with free in-store pickup. 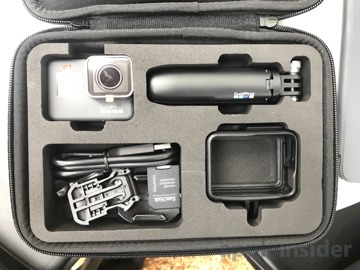 Those looking for accessories can find the GoPro Bite Mount with Floaty and GoPro Shorty at B&H as well.